McAfee SiteAdvisor software is an award-winning, free browser plug-in that gives safety advice about Websites before you click on a risky site. With SiteAdvisor software installed, your browser will look a little different than before. It adds small site rating icons to your search results as well as a browser button and optional search box. Together, these alert you to potentially risky sites and help you find safer alternatives. It puts coloured icons next to your search results so you know the status of the site before you click on the link. Sites that are considered safe get a small green icon, sites that may be unsafe are labelled with a yellow icon to indicate caution, and sites known to be risky are marked with a red label. 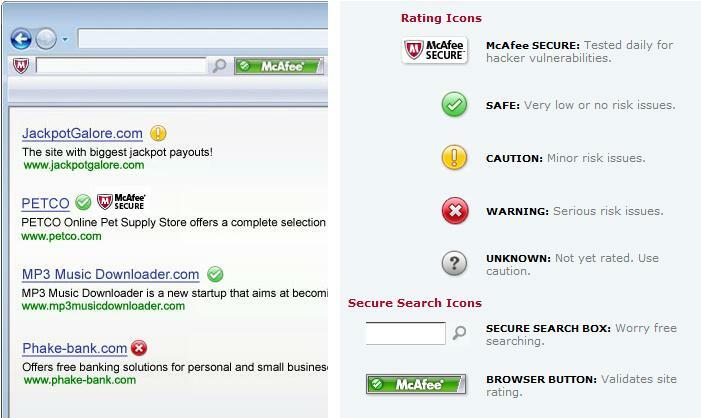 McAfee tests the sites for spyware, drive-by downloads, spam, scams, phishing, and other risks to determine their security rating. And it doesn’t collect any personally identifiable information. McAfee rates more than 95% of the Web for safety. Protects you from adware, spyware, spam, viruses and online scams. Advises you about the safety of sites using a coloured button in your browser toolbar. Enhances your online search by placing site ratings next to search results. Warns you about dangerous sites and search results with clear messages. Provides you with detailed test results for every site. Updates automatically to protect against new threats. I don’t know the reason why I cannot join it. Is there anybody else getting identical RSS issues? Anyone who knows the solution will you kindly respond? Thanks!! Thank you very much Ollie. done a fantastic job with this. Additionally, the blog loads super quick for me on Internet explorer.